Not specified in Bible verses, I have made it mid day. Just a few minutes after the previous scene. Light is streaming in through the high, narrow window. 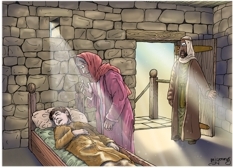 The boy who had just died in his mother’s arms has been carried up & placed by his mother onto the bed in Elisha’s room, which is situated on top of the Shunammite couple’s home. Notice the boy’s eyes are closed & he has a deathly pale skin colour which illustrates his condition. 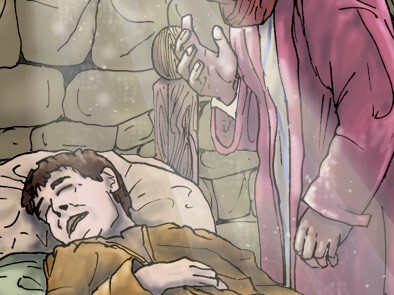 This scene is quite sad, but fortunately the Lord uses Elisha to bring the boy back to life, later in the story. I enjoyed drawing the dust motes & sun’s rays coming in through the door & window (see below.) Windows in ancient buildings were often small, allowing only a little light in, & providing ventilation. The use of small windows was a method of excluding thieves!